This discussion with Amelia enabled me to touch on some deep terrors of the past six years. I confided that, with very few exceptions, I had been avoiding any talk about my illness. Or if I mentioned it, I would gloss over the most difficult aftereffects. In Amelia’s opinion, trying to keep the extent of my illness a secret had probably been isolating, and would eventually become too much of a burden for me. As we talked, I had a sudden insight: my feeling about the aftereffects had a lot in common with a sense of shame. As I got to know Amelia better over time, whenever she mentioned that she preferred to “get down into the well” with a patient, rather than sitting at the top and trying to pull the patient out, I always thought of that first extended discussion when she had been willing to do exactly that with me—the first time anyone had truly done so. I had a loving family and some good friends, but I had rarely let anyone go with me into the dark places. Until I met Amelia, I had mostly felt alone in those dark places. This great new gift of friendship with someone who understood the psychological toll that my post-polio years had taken, and who could enable me to discuss it for the first time, was priceless—probably the single most important stroke of good fortune in my entire post-polio life. Another startling aspect that emerged as I got to know Amelia was her view of my options—a view no one else seemed to share. I had told her where my change in direction was headed, since piano playing was going to be mainly for myself and as an aid to teaching. 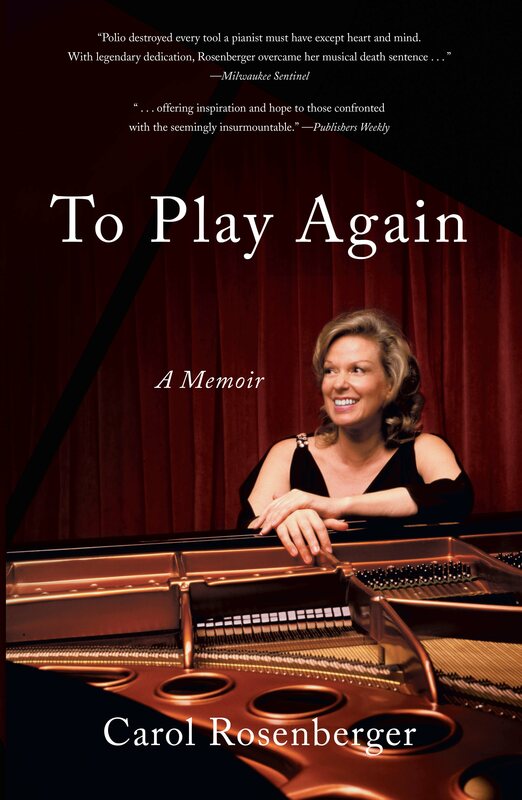 But against all conventional wisdom, she was convinced that I still had something to say as a performing pianist. Although Amelia came from outside the music world, she listened frequently to the best of classical music performances with a keen ear that many top musicians were to comment on in the years to come. Here was the amazing truth: she heard in my playing some of the things I had carried around in my head and heart ever since those struggling days in Vienna, when I would imagine the music as I wanted to hear it and would will it to take powerful shape in my mind. It was life-changing to discover that Amelia found those musical ideas treasurable, despite my handicapped playing mechanism. I already knew that the best plan was always to approach any passage—even one containing what appeared to be an insurmountable problem—as if it were about to reveal itself. And for that approach to be most effective, I had to anticipate the potential revelation as joyful, fun, or intriguing. I had to feel that I was just about to find the way.